The 2017 Residential Landscape Architecture Trends Survey conducted by the American Society of Landscape Architects sheds light on what homeowners want. 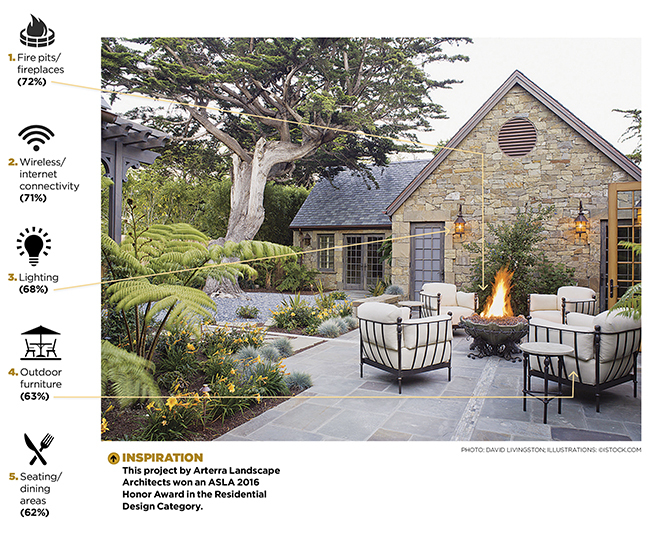 The top five elements in the outdoor design category are illustrated above. Consumers prefer sustainable—yet tech-friendly—design elements for their outdoor living spaces, according to the 2017 Residential Landscape Architecture Trends Survey conducted by the American Society of Landscape Architects (ASLA). For the first time, wireless/internet connectivity entered the top 10 project types, suggesting that people want a backyard that allows them to enjoy both nature and connectivity. Landscape architects were asked to rate the expected popularity of a variety of residential outdoor design elements in 2017. The survey was fielded in February and netted 817 responses. (50 percent), decks (41 percent), fencing (40 percent) and arbors (39 percent) are expected to be the most popular outdoor structures. 1 Comment on "Top outdoor design elements homeowners want"
Those who definitely want to plan and have an outdoor living style will definitely love to have internet connectivity outside, but it is not good for parties for nobody will be able to give proper time to the gathering if messages from workplaces and fellows keep coming.